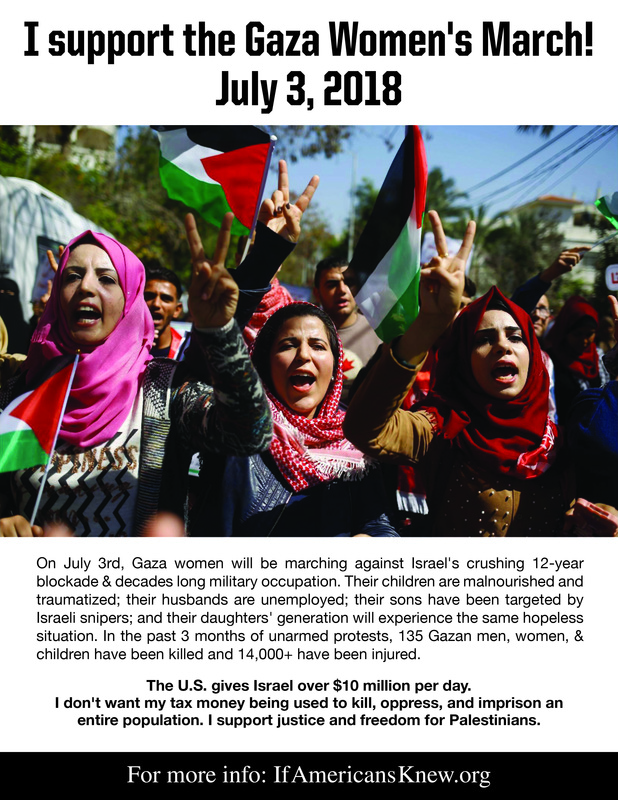 The women of Gaza are asking women and others around the world to perform solidarity actions for their July 3rd march for freedom from Israeli oppression. Since many people may not have time to organize an event, below is a downloadable flyer that people can display in home and car windows, hand out, place in cafes, distribute during other marches for human rights, etc. For more information on the Gaza Great March of Return in general, go here. A downloadable factsheet that you can also distribute is here (you could print this on the reverse side). Right-click on the flyer below to save it and print it out. Also available as a PDF and High-Res JPG. A mass women’s coalition in Gaza is calling for support from feminist groups around the world to help end the siege. Organizers of the Great March of Return and Breaking the Siege are seeking worldwide support for a Women’s March to take place on July 3, 2018. How cool would it be if thousands marched for Palestinian freedom just a day before we celebrate our freedom in America? On Tuesday, 3 July, the High Committee of the Great March of Return and Breaking the Siege is organizing the first women’s march since the protests began on 30 March. The organizers are inviting women around the world to support the women of Palestine in ending 70 decades of occupation and more than a decade of blockade and siege. In a press release, the organizers invited women as both individuals and groups to join the event and to help give a voice to the voiceless and shed a light on the suffering and injustice that have befallen the Palestinian people for decades under the Israeli occupation. The High Committee of the Great March of Return hopes that women across the globe will join the protests, both in Gaza itself and by holding solidarity events in their own countries to demand an end to the 12-year Israeli blockade of Gaza, imposed in 2006, which has affected all aspects of life, from the economy to health, education, access and freedom of movement, farming, fishing, and the rebuilding efforts following three devastating Israeli bombings. More broadly the Committee calls for an end to the 70-year occupation of Palestine. The Committee reiterated that this protest is affiliated with no political party, faction or government, but independently represents all Palestinians regardless of political affiliation. A 2012 UN report warned that Gaza would become “unlivable” by 2020 unless current trends were reversed.